Most human beings hunger after riches and success. There are any number of management books which provide theories and techniques on how to become rich and successful. All of them advise us to chase Lakshmi, the goddess of wealth, in order to make her our own.But the Indian approach to prosperity and fulfillment warns against the relentless pursuit of the goddess, writes noted thinker and mythologist Devdutt Pattanaik, as it will result in conflict. 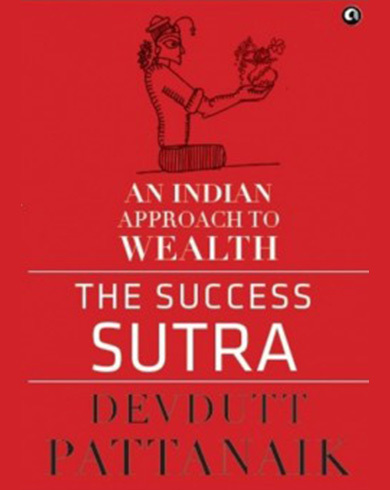 The Success Sutra is packed with unique and profound insights into how individuals can create wealth and achieve success in life by following Indian principles of strategic thinking and decision-making. *By Devdutt Pattanaik, the author of more than a dozen bestselling books on mythology and management, leading columnist for business newspapers and one of the country’s foremost motivational speakers. *The book takes a practical and distinctive look at wealth and how to achieve success in life, using stories, symbols and rituals from Hindu, Jain and Buddhist mythologies. *Devdutt Pattanaik hosted widely popular TV show Business Sutra on CNBC. His TED talk on mythology and management received over 8, 10,000 hits online. *The Success Sutra carries creative and informative illustrations by the author that elaborate the concepts being discussed. *Plenty of insightful anecdotes and examples of people from all walks of life that readers can relate to.